The Future of Shoe Design? Additive Manufacturing/ 3D printing has been dominating industries like automotive, aerospace and manufacturing, but it’s also been impacting the fashion industry including footwear. Leading CAD/CAM footwear software, Delcam CRISPIN and 3Dshoes.com have been supporting this unique application for years. 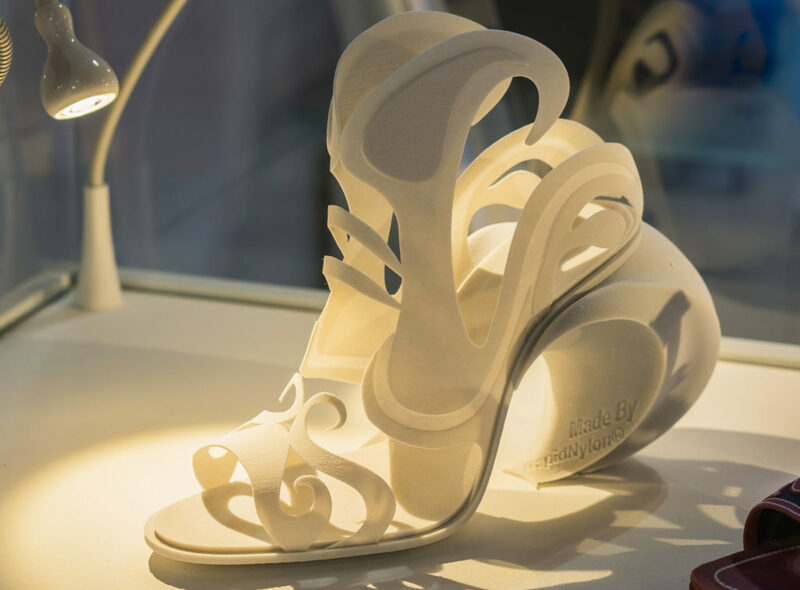 Together they organized a Global Footwear Competition which combined both industry professionals and students to compete using Delcam CRISPIN software to come up with 3D designed and printed shoes to be featured at one of Milan’s massive trade events. After 100’s of entries only the top three would be prized with the chance to present their designs at the SIMAC exhibition in Milan, Italy. The winners included an animal inspired high-heeled sandal, a hybrid high-top sneaker and boot, and finally a “spiraling evolution” heel. Synergeering was asked to participate in the competition by producing the design best suited for Laser Sintering and it was no question that Cari-Dawn Conejero Campbells’ “spiraling evolution” heel was the “perfect fit”. Conejejro Campbell’s inspiration came from “the Mayan snail-shell symbol of ever spiraling evolution”. She also notes “appearing as part of the wearer’s foot, an extension of the path we walk into the future of footwear design.” The shoe (shown above and below) was designed with no limitations with the freedom that laser sintering technology offers and was also durable enough to actually wear!